I begin to fathom the sound and the fury, of the world and of history: the noise. Following scientific tradition, let us call noise the set of these phenomena of interference that become obstacles to communication. Thus, cacography is the noise of graphic form or, rather, the latter comprises an essential form and a noise that is either essential or occasional. To write badly is to plunge the graphic message into this noise which interferes with reading, which transforms the reader into an epigraphist. In other words, simply to write is to risk jumbling a form. In the same way, to communicate orally is to risk losing meaning in noise. . . .[C]ommunication is a sort of game played by two interlocutors considered as united against the phenomena of interference and confusion, or against individuals with some stake in interrupting  communication. These interlocutors . . . battle together against noise. The cacographer and the epigraphist, the cacophonous speaker and the auditor, exchange their reciprocal roles in dialogue, where the source becomes reception, and the reception source (according to a given rhythm). . . . To hold a dialogue is to suppose a third man and to seek to exclude him; a successful communication is the exclusion of the third man. The most profound dialectical problem is not the problem of the Other, who is only a variety — or a variation — of the Same, it is the problem of the third man. 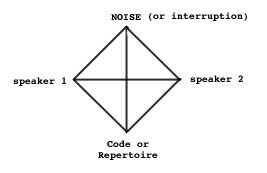 We might call this third man the demon, the prosopopoeia of noise. But, for Serres, noise is also the pure multiplicity that serves as a background to all we do, the ground to our figure. Systems are “islands of ordered relations upon an ocean of noise” (Weissman and Adkins). [Joseph Weissman and Taylor Adkins,] “Warning, Hive Meltdown Immanent: Serres, Negarestani and Deleuze on Noise, Pestilence and Darkness,” Fractal Ontology (19 Oct. 2007) [Fractal Ontology]. More from Serres . . .
Genesis, trans. Geneviève James and James Nielson (1982; Ann Arbor, MI: UMP, 1999) [see the section on noise, pp. 12ff.]. Reblogged this on [ ].